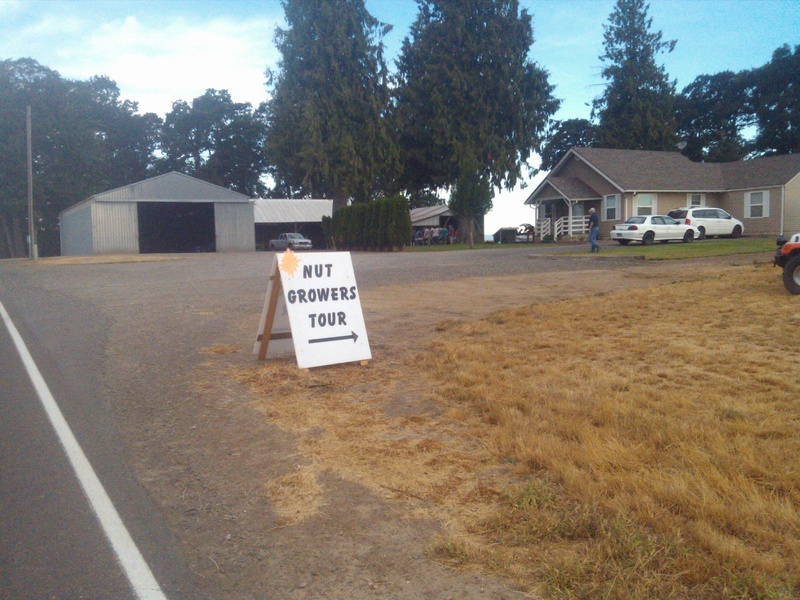 Every year the Nut Grower’s Society of Oregon puts on a tour of hazelnut orchards. This happens to be the “slow” time for filbert farmers (not so much for grass seed or wheat farmers) and this year the rest of our crops were looking like they would be pretty early so we decided to help out! The first stop on the tour was to Kirsch Family Farms. This tour has gotten larger and larger over the past few years. Just five years ago the tour would include about 200 to 250 farmers. 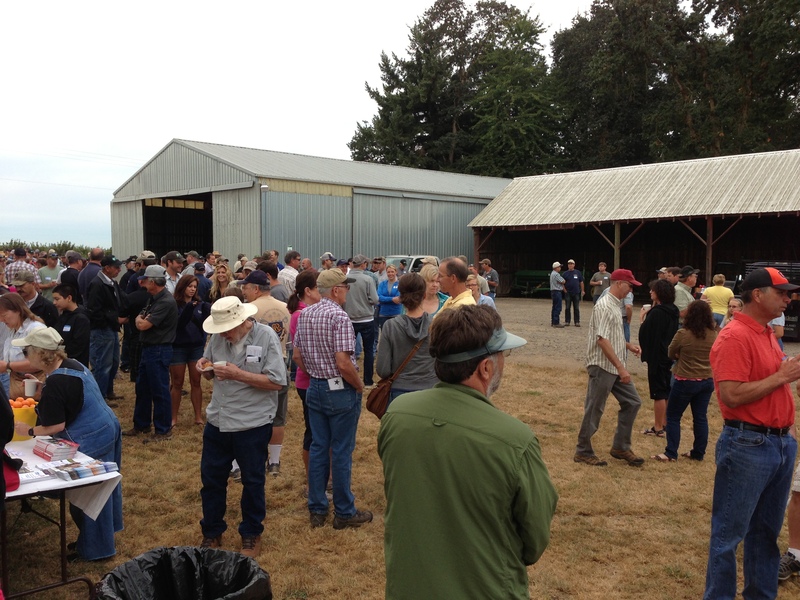 Today the tour has grown to over 500 interested in the hazelnut industry. So why has it become so interesting…it’s because people around the world are literally going nuts over Oregon hazelnuts! 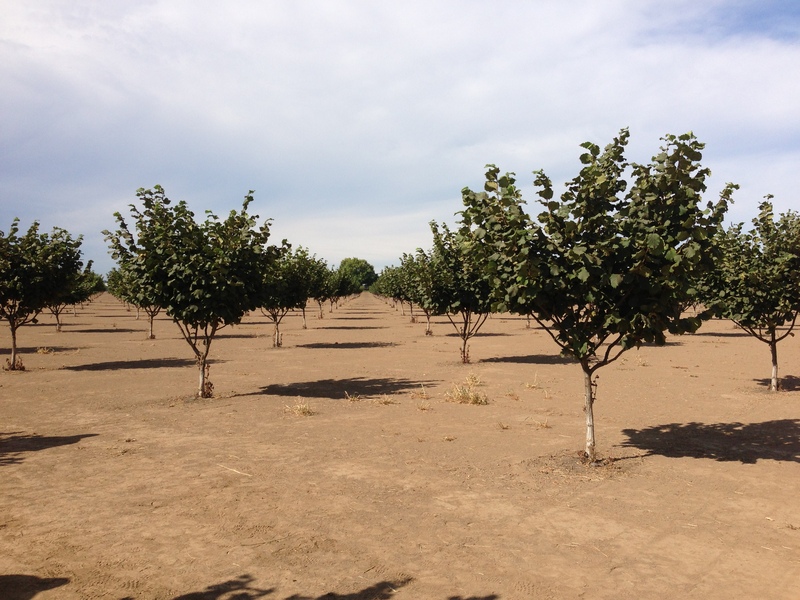 Demand is there and new research has also brought about new trees that fight our biggest contender with the industry here, eastern Oregon filbert blight. 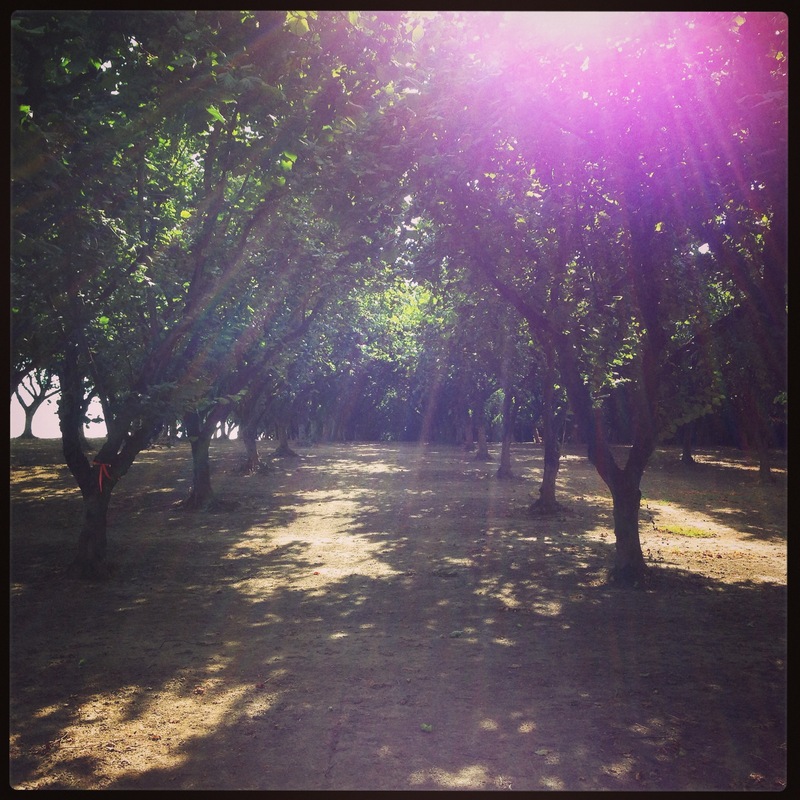 Over 20 years ago we planted Barcelona trees (older orchard shown below), and with the blight susceptible variety we have to spray multiple times a year, prune all winter, and we still loose branches and even entire trees to this bad disease. So with a blight resistant gene, the future of our industry and being able to plant these new varieties (small trees also pictured below) is looking very bright! 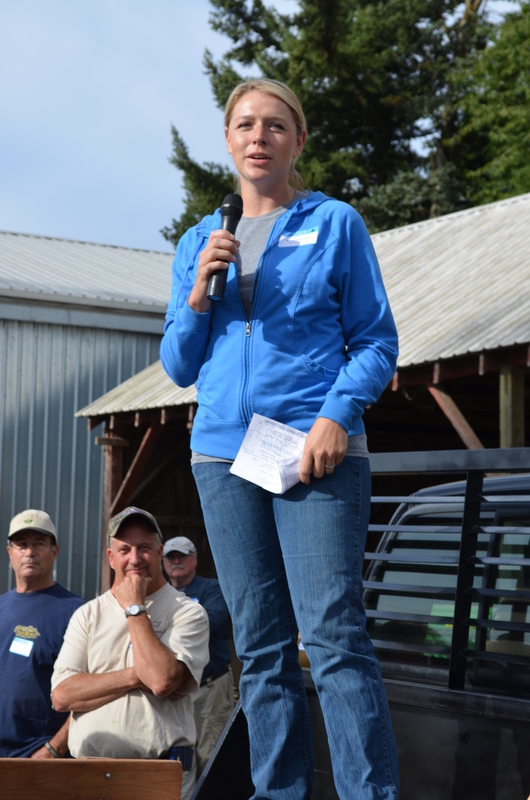 The tour includes many topics, this year they covered how to manage your orchard floor and canopy, new equipment options that are becoming available, pros and cons of varieties, along with many other interesting topics. Most of the presenters are farmers themselves who want to share what has worked for them and what hasn’t. Also among presenters are extension agents and market representatives. I gave a presentation about our tree canopy and how to “thin” the trees. Trees need a certain amount of light to come in so that the nuts can be produced to the fullest extent that the tree can handle. So the past 4 years we have been taking trees out of our orchards. This is not an easy process, so talking with other farmers about challenges we faced, solutions we found, and ways we think it will be easier in the future I hope will help out some farmers in the future with their own thinning process. I get asked a lot why I would want to share information about our farm to other farmers, “Aren’t they your competition?” Yes in a sense I suppose they are market competitors, but in the big picture they are really more of a team player I like to think. Many time as one farmer you rarely have your own market, you have to rely on many other people to be successful in order to make the whole market a success. For instance we are members of the Nut Growers Society, a group that not only takes on the job of planning out this tour, but also works tirelessly to create marketing around our filberts. It takes a lot of farmers working together to produce the pounds it takes to keep markets happy, so I’m happy to be sharing what we’re doing on our farm with others hoping that they find success as well! I truly think that this “nutty” industry will keep growing for a long time especially since we live in such a wonderful region for growing these nuts! I believe that it’s a great crop for Oregon and one that there seems to be a lot of room for new growers and new acres. **Special big thank you to Mike Klein & Kyle Cone for their great photographs!